Overall, agriculture dominates all other water uses in the basin, accounting for more than 80% of water withdrawals (Timmerman 2005, Karyabwite 2000, FAO 2011b). The total equipped area in the Nile Basin is estimated at 5.4 million hectares. Actual cropped area is estimated at 6.4 Million hectares. The cropped area is variable depending on what percentage of the irrigation equipped areas is covered by crops in any given year and whether more than one crop is planted. In most Nile Basin countries, the cropped area is much less than the area equipped for irrigation. Egypt has the highest cropping intensity (cropped area divided by equipped area). Due to higher cropping intensity, approximately 79% of the total cropped area under irrigated agriculture in the Nile Basin lies in Egypt. 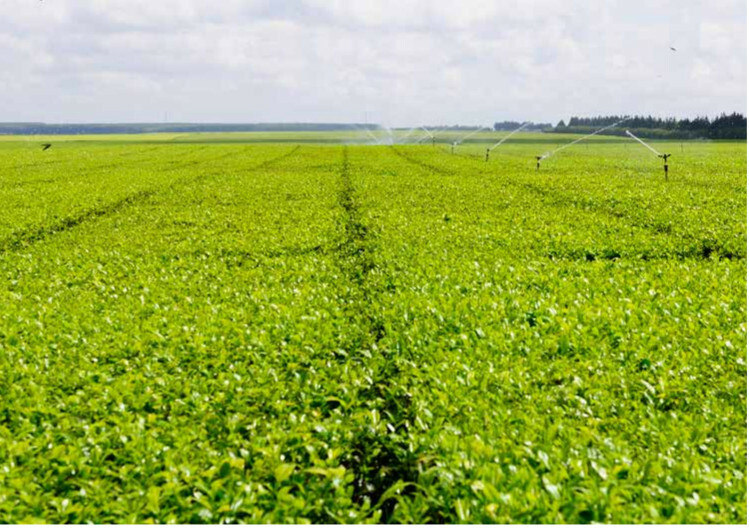 The equipped irrigated area is dominated by the large schemes in Egypt (3.45 million ha) and Sudan (1.764 million ha), while in the remaining parts, only relatively small areas of irrigation have so far been developed. In Egypt, the use of double cropping means that the effective area in production is greater than the total area of land under irrigation. The vast majority of the irrigation water requirements are supplied from surface water. The table below shows estimated equipped and crop areas across the Nile riparian states. The Growing agricultural production will further increase pressure on land and water resources. A realistic assessment of future food requirements is therefore essential for Nile Basin governments to take informed decisions about agricultural planning and water resource use. In most of the Nile Basin countries, irrigation systems use surface gravity method of water application where water is conveyed through open canals and finally distributed over the irrigation fields by gravity. However, some pressurized irrigation is practiced in Egypt, Sudan and in some schemes in Ethiopia, Kenya and Uganda. In all countries except Egypt and, to some extent in Sudan, there are no drainage systems whereby excess water is removed from the irrigation fields.